Lightly oil the bottom of a medium size baking dish. 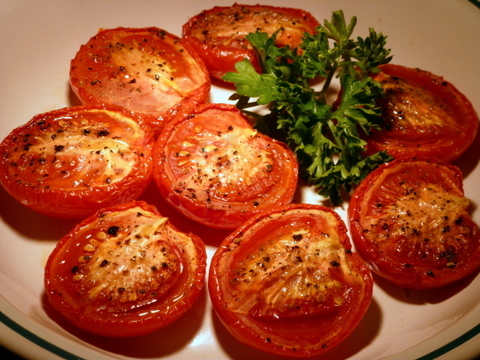 Place tomatoes in the baking dish cut side up. With your fingers or the back of a spoon, smear a little of the olive oil on the top side of each tomato half, then sprinkle with a little salt and pepper. Place tomatoes in the oven and bake for 3 hours. Check on them about half way through to be sure they are not cooking too fast. The tomatoes will reduce in size, and this should be a slow process. You can reduce the heat to 225 or 250 degrees to slow cooking. When done, the tomatoes will be sweet and more dense. The skins will easily peel off. Serve them with other side dishes. They are especially good with rice. You can use them in your pasta dishes. After the slow cooking, the flavor is intense and very "tomatoey". This is a good recipe to double or triple in size to use the tomatoes in several different dishes.